What size of boiler do I need? Given that a new boiler is one of the most important investments that you will make in your home, it is important to make the right choice. A new boiler will typically last up to fifteen years and will be responsible for providing for your heating and hot water needs all day, everyday. Choosing the right boiler size will ensure that your house is warm enough and that you have sufficient hot water whenever you need it without spending any more than you have to on your energy bills. So what factors do you need to consider before choosing what size boiler your home needs? Here’s what you need to think about. How is boiler size measured? Before we look at the factors affecting which boiler size to choose, it is important to ensure that we understand how boiler size is measured. Boiler size actually refers to the output in kilowatts (kW), not the physical dimensions. A kilowatt is a unit that is used to measure how much energy is output by the boiler in the form of heat. Generally speaking, the more heat and hot water you require, the higher the output you will need although other factors also play a part in choosing the right size. Should I choose an oversize boiler? Modern advances in boiler technology mean that they are now more efficient than ever. In the past homeowners were often advised to choose an over-sized boiler to compensate for heat loss, this is no longer recommended. It will result in wasted energy and is likely to leave you paying more than you need to for your gas bill. Most UK households use a combi-boiler which serves both heating and hot water on demand from the mains water supply. They are practical, convenient and fairly low cost to run and where there is just one bathroom are often quite sufficient to meet the needs of the household as far as hot water is concerned. If, however, you have a large or growing family or your home has more than one bathroom, a combi-boiler may struggle to provide sufficient hot water. This is because the water is heated as it is used, rather than stored in a tank. If you are likely to be using more hot water, you will certainly want to consider whether a conventional or system boiler that includes a hot water tank is the right choice. Ultimately, which type of system you choose will have an impact on the size of boiler you need. A combi-boiler is sized to provide hot water on demand and you will see its capability to do this expressed in terms of how much water it can heat per minute to a defined temperature rise, e.g. 12 litres per minute at 35°C rise. The higher the flow rate you require, for filling baths more quickly or to have a more powerful shower, the higher the output combi-boiler you will need. This means that they are typically over-sized for central heating and therefore less efficient than other types of boiler, such as system and conventional boilers, when heating the home. System boilers and conventional boilers preheat hot water to be stored in a hot water cylinder and therefore hot water flow rate is not as critical. The heat load for an average home can vary from around 10 kW to 20 kW, which means that system boilers and conventional boilers can be sized lower than combi boilers. They will therefore be more efficient when heating the home, but they require more space. Another key factor that will have an effect on the size of boiler you need is the number of radiators. If you have just a few, for example in a small flat, then choosing the smallest suitable boiler will offer you the greatest level of economy and ensure you avoid paying more than you need to for energy. An average three or four bedroom house typically has around ten radiators and will usually require a small or medium combi boiler, for example 24-30 kW. A larger house with substantially more radiators or an en-suite bathroom will generally need one that is larger, typically 30-35 kW. 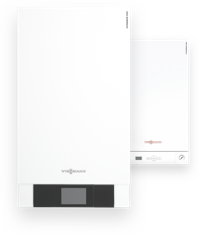 If you have a large house with as many as twenty radiators, a large 35-42 kW combi boiler may be needed to provide sufficient heat with the best economy, or you would be better to change to a system boiler which could be sized more appropriately. In the past, the physical size of your house was often used as a factor in considering the right size of boiler. Whilst this still plays a part, a much better way to choose the most effective and efficient boiler size is to have an expert calculate your home’s heat loss. Heat loss calculations take into account a range of factors including floor area, number of radiators, number and type of windows, insulation and other aspects that will cause heat to be lost from your home. A heating expert will then use this information to work out how much heat your house will lose on the coldest day of the year, allowing them to advise you on the optimum size of boiler. The type of fuel available in your property can also affect the size of boiler you choose, as boilers for different fuels can vary in terms of efficiency. Most UK homes use gas boilers which offer the greatest level of efficiency, whilst houses that are not connected to a mains gas supply often choose to use an oil fired or LPG (liquefied petroleum gas) system instead. An alternative option that is less common but is growing in popularity is biomass, although this is only an option in areas that allow such fuel to be burned. The type of boiler system you use and the ideal size for your home may be affected by these factors and it is recommended that you seek advice from a professional in order to make the best possible investment. Although this is not usually a concern for newer houses on a mains water supply, some older homes may not have a suitable high pressure water supply and this can have an impact on the type and size of boiler you choose. A combi-boiler must be big enough to cope with the amount of water passing through it to be heated. The higher the flow rate, the bigger the boiler will generally be. Whilst most manufacturers provide information on the maximum flow rate for their boilers, getting a professional to help you may help to choose the most economical boiler for your home, helping you to save money in the long term. Some modern boilers are built ready for future energy sources. For example, it may be possible for your boiler to use energy from solar panels on your house as an additional energy supply. If you choose to install a boiler that supports renewable or future energy sources, this may also become an important factor in deciding the right size of boiler. Whatever size of boiler you ultimately choose, be aware that its effectiveness and efficiency will remain at their best if you have it serviced annually by an installer trained or accredited by the manufacturer. Maintaining your system correctly is the best way to ensure that you always have the right amount of heat and hot water at the lowest possible cost.